In the weeks since President Trump vowed to “totally destroy” the Johnson Amendment – the language in Section 501(c)(3) that protects charitable nonprofits, foundations, and religious congregations from being exploited as partisan tools – nonprofit and religious leaders across the country have been standing up for nonpartisanship. They oppose both total and partial destruction, as proposed by new legislation in Congress (S.264; H.R.781) that would blur the current clear language that conditions tax-exempt status in part on not engaging in partisan, election-related activities for or against candidates for public office. Most commentators emphasize the legal reality that nonprofits are free to express their views on the issues of the day – public policy matters that are distinct from partisanship for political purposes – and are only restricted in that they cannot give endorsements or campaign cash/support to officials for elected office. The National Council of Nonprofits has taken a strong stance in support of nonprofit nonpartisanship and has created a dedicated webpage on Protecting Nonprofit Nonpartisanship with analysis and other resources on this serious challenge to nonprofit identity, independence, and integrity. Readers are asked to share your insights on what repeal or revision of the Johnson Amendment would mean to your operations and to the integrity and trust of the nonprofit community. We seek your input on how best to communicate the benefits of nonpartisanship, and to help imagine the challenges that would arise if nonprofits were subject to demands for endorsements by politicians, their operatives, and politically motivated donors. Provide your insights today! Nonprofit and foundation leaders from across the country traveled to Washington, DC, last week to make the case to Congress that the charitable giving tax incentive is an effective tool for supporting good works in communities. Organized by the Charitable Giving Coalition, the 100 Years of Charitable Giving DC Fly-In enjoyed the participation on Capitol Hill of 200 individuals from 37 states and the District of Columbia. Teams of nonprofit staffers, board members, and funders attended numerous meetings with Senators, Representatives, and staff to deliver key messages about the importance of retaining the charitable deduction as lawmakers consider comprehensive tax reforms this year. Responses from elected officials ranged from unambiguous support (“I’m with you”) to questions about data and impact and uncertainty about when and how the tax-reform process will play out. The Fly-In demonstrated that the nonprofit and foundation communities are united in support of preserving the charitable deduction that was first enacted in 1917 (hence the “100 Years” designation). Fly-In participants also advanced proposals to expand this giving incentive so it is universally available to all Americans to support their communities through enactment of a non-itemizer deduction. The calendar for the ambitious legislative agenda that congressional leaders announced earlier this month is already slipping due to opposition, overload, and disagreements over policy solutions. The stated goal of repealing and replacing the Affordable Care Act in March is looking unlikely as lawmakers in the majorities of the Senate and House disagree on many substantive points, leading to a proliferation of bills rather than consensus on one package. Comprehensive tax reform remains a high priority, but a late-July deadline now appears to have given way to promises of action “this year.” One factor in the delays is opposition by Senate Democrats to President Trump’s cabinet and other nominees, opposition which has led to many late-night sessions and prevented action on legislation. Further, the House and Senate won’t take up tax legislation until the healthcare reform bill is concluded due to arcane budget rules that permit certain legislation to go to the Senate floor without needing 60 votes to overcome a filibuster. Certain agenda items remain tied to the calendar. The deal in 2015 to put off action on the federal borrowing limit expires in mid-March and the continuing resolution that funds the federal government expires April 28. While some priorities may fail to materialize, the primary questions remain when and in what form legislation will be enacted. Draft Executive Order on Immigration. The National Association of Counties is raising concerns that if a draft presidential executive order is signed that targets legal immigrants who are not U.S. citizens, such as green-card holders, it will increase administrative burdens and costs for states and counties – as well as many nonprofits. According to Governing, “Immigrants can currently be deported for using cash welfare or long-term institutionalized care.” But if the draft executive order is signed, “they could be deported for using any federal benefit given ‘on the basis of income, resources or financial need,’” which would include free or reduced school lunch, Temporary Assistance for Needy Families (TANF), Supplemental Security Income (SSI), Medicaid/ Children’s Health Insurance Program (CHIP), and food stamps (the Supplemental Nutrition Assistance Program, or SNAP). Until now, nonprofits generally have not been responsible for determining a person’s immigration status in order to provide services or report an individual’s status. Census Dubbed a High-Risk Federal Program: Rapidly escalating costs of conducting the U.S. Census have caused the Government Accountability Office (GAO) to declare the 2020 Census as a “high-risk area needing attention by Congress and the executive branch” due to “greater vulnerabilities to fraud, waste, abuse, and mismanagement or the need for transformation to address economy, efficiency, or effectiveness challenges.” The GAO found that the cost of the census has been escalating over the last several decennials; the 2010 Census was the costliest U.S. Census in history at about $12.3 billion, about 31 percent more than the 2000 Census (in 2020 dollars). Placement of the 2020 Census on GAO’s High Risk List draws greater attention from Congress to numerous recommendations for reforms. Since GAO's last high-risk update in 2015, GAO found that many of the 32 high-risk areas have shown solid progress due in part to the concerted efforts of Congress and leadership and staff in agencies, including enactment of over a dozen laws to help address high-risk issues. Every year, states consider scores of bills designed to adjust, restrict, or even expand property tax exemptions of nonprofits and foundations. This session of state legislatures is presenting greater diversity of issues and activity. Seeking to close a $1.7 billion budget deficit, Connecticut’s Governor Malloy is proposing that the state save money by ending its longstanding reimbursements to localities to cover tax revenues they theoretically lose from hospitals being exempt from taxation. But, his budget also seeks to authorize towns and cities to levy property taxes on the land and buildings of nonprofit hospitals. Running counter to this erosion of consistent nonprofit tax law, two bills (HB 6675, HB 6934) in Connecticut would permit municipalities to abate property tax for property used for arts or culture, including art galleries, art studios, installation galleries, movie theaters, performance venues, and retailers catering to or relating to the arts. Oregon has several bills that propose changes to property tax treatment for nonprofits. One affects limited liability companies owned by nonprofits, two (HB2047, HB2115) deal with expanding the exemption for health clinics, and other proposals would expand informational filings and create a study on ad valorem property taxation. Virginia legislation would expressly authorize local governments to enter into mutually agreeable terms with entities exempt from real property tax for the payment of service charges. Finally, a Montana bill sought to remove the property tax exemption for any nonprofit that pays compensation greater than $250,000. The bill sponsor reportedly was concerned about competition between hospitals, which pay higher salaries, and small businesses. The legislation was soundly defeated in the State House of Representatives last week, based on arguments in support of nonprofits pursuing their mission and a desire not to enact legislation that interferes with the free market. The defeat of the bill is significant because the linkage between executive compensation and nonprofit property tax exemption has also been made in legislation in Connecticut and elsewhere. Illinois: The Pay Now Illinois coalition has filed a second lawsuit against Illinois Gov. Bruce Rauner in an attempt to get paid for a wide variety of social services nonprofits provide to people, such as sexual assault victims, senior citizens, and low-income children, after a temporary budget expired in January. The suit contends the lack of a balanced budget violates the Illinois state constitution. Kansas: After years of cutting taxes, the Kansas Senate is looking to repeal an LLC exemption and raise individual income tax rates, estimated to generate $230 million a year. Minnesota Governor Dayton’s budget includes several expansions: to the sales tax exemption to all 501(c)(3)s; to the working family credit; and access to health care. Nebraska legislators voted to give final approval on a budget that would reduce the $900 million budget gap to $760 million through across-the-board cuts, specific cuts, and taking back unspent dollars. Pennsylvania Governor Wolf proposes cuts and agency consolidation under a $32.3 billion spending plan for next year. Despite half the states experiencing budget deficits, a few are considering restoring or expanding incentives for charitable giving. Massachusetts legislation would bring back the charitable deduction that hasn't been available to Bay State taxpayers for several years because of a restriction in current law related to state revenues. A bill in Oregon would establish a personal income tax credit of $50 (single) or $100 (joint) for contributions to charitable organizations. That credit, if enacted, would only be available to taxpayers with less than $100,000 (single) or $200,00 (joint) in adjusted gross income. Utah legislators are considering a measure that would create a state non-refundable tax credit for certain contributions to a nonprofit related to an approved project in an enterprise zone. Legislators in Kentucky and Massachusetts have recently introduced bills seeking to create commissions designed to improve their respective government-nonprofit contracting systems. Throughout 2016, Kentucky’s legislative Government Nonprofit Contracting Task Force evaluated contracting challenges that nonprofits face when providing services on behalf of the Commonwealth. Following up on the recommendations of that Task Force, legislation would create a government nonprofit contracting advisory commission charged with reviewing and providing periodic reports regarding laws, regulations, and policies that negatively affect nonprofit government contracting. In Massachusetts, a bill would create a special commission on government-nonprofit partnerships made up of government and nonprofit representatives. The Massachusetts commission would, among other things, identify methods to improve efficiency in grant and contracting systems, seek to eliminate redundant, unreasonable, or unnecessary laws that negatively impact nonprofit-government contracting or funding, and investigate ways to increase the use of data and technology to inform decision-making and oversight. The 100 Years of Giving Fly-In brought more than 200 nonprofit advocates together on February 16 to make the case before Congress that the charitable deduction tax incentive is vital to the work of nonprofits in communities throughout the United States. Individuals traveled from 37 states plus DC by cars, trains, and airplanes to lobby their Senators and Representatives. And as impressive as their presence was on Capitol Hill that day, colleagues who couldn't make it to town still made the effort to raise their voices in support. For instance, when distance and timing prevented in-person presentations, several people called into the congressional offices while coalition meetings were taking place to join the discussions. Others, like Mike Walsh of the Foraker Group in Alaska, Skyped (participated via video conference) into the meetings to provide the personal connection. The letter from the North Carolina Center for Nonprofits provided insights into how charitable giving could be impacted by multiple changes in the tax code as part of the comprehensive tax reform process. “Since many tax reform proposals call for increasing the standard deduction, the addition of the non-itemizer deduction would go far to overcome the likely decrease in charitable giving that most economists predict will otherwise occur as the number of itemizers decreases,” Trisha Lester and David Heinen of the NC Center wrote. It’s inspirational to see that nonprofits take every opportunity – whether in person, via electronic assistance, or through the written word – to advocate for their missions and make sure their voices are heard. 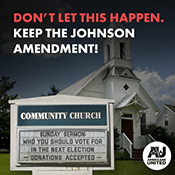 --“Johnson Amendment repeal would ‘destroy’ church unity,” Marv Knox, editor, The Baptist Standard, February 8, 2017. --“How Abolishing the Johnson Amendment Would Harm Religious Liberty,” Greg Hamilton, President, Northwest Religious Liberty Association, in ReligiousLiberty.TV, February. 9, 2017. - A Rabbi Defends the Johnson Amendment, David Wolpe, The Atlantic, February 19, 2017. - “Keep the Johnson Amendment,” editorial, National Catholic Reporter, February 18, 2017, expressing strong support for retaining the current tax-law prohibition on nonprofit political activity (known as the Johnson Amendment) and correcting misperceptions of what is and is not permitted. Losing the Johnson Amendment Would Destroy the Unique Political Role of Nonprofits, editorial, Nonprofit Quarterly, February 6, 2017, rebutting the arguments in support of repealing the Johnson Amendment and highlighting the important protections that the tax-law ban on partisan, election-related activities afford charitable nonprofits. Obamacare Repeal Remains Elusive, Lou Cannon, StateNet Capitol Journal, February 16, 2017, providing a comprehensive review of the challenges confronting congressional policymakers in seeking to repeal and replace the Affordable Care Act. Tax reform outlook: Frequently asked questions, Grant Thornton, January 30, 2017, addressing the most common questions on the likelihood that tax reform will occur and providing a summary of the core elements of the currently available tax reform proposals. Love, power, and the nonprofit sector, Vu Le, Nonprofit with Balls, February 6, 2017, explaining why and how organizations must engage in advocacy and lobbying. Adding Up Impact 2017, Maine Association of Nonprofits, February 2017, reporting the latest economic and social impact of Maine’s nonprofit sector, illustrating how nonprofits are central to making Maine communities better places to live, work and visit. See also, All About Maine’s Nonprofits. Nonprofit Impact: Montana’s Nonprofit Economic Report, Montana Nonprofit Association, January 2017, providing up-to-date data on the economic impact of the nonprofit and foundation communities in Montana. Source: “Most Americans oppose churches choosing sides in elections,” Pew Research Center (Feb. 3, 2017).